One of the things that I love the most about travelling is the chance to not only see and experience new places myself, but to take a snapshot of those spots back home with me to share with my family and friends. Yes, I’m talking about photography and you won’t see me on a trip anywhere without my camera to hand. Marrakech in Morocco is something of a photographer’s dream, with beautiful buildings, colourful characters and a mountainous backdrop to round it all off. So, if you’re planning a trip to the Moroccan city, check out some of the following spots if you’d like to get some stunning and inspirational photos of your holiday. It shouldn’t be hard to find a hotel in Marrakech that’s close to some of the places mentioned below. Djemaa el Fna is the main square in the old part of Marrakech and it’s a real feast for the senses at any time of the day. 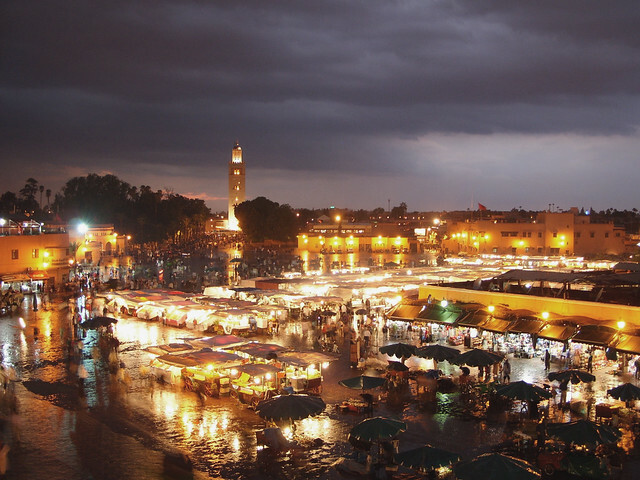 Around its edges are pavement cafes and vendors selling delicious local food, while street performers entertain the crowds that meander around admiring the old city walls and the souks in a network of alleys that lead away from the square. One of the best times of day to visit for photography is early evening, as the square begins to get busier and all the steam rising from the food stalls creates an atmospheric backdrop as darkness creeps in. Look out for the storytellers, acrobats and Berber musicians who arrive in the evening to keep visitors amused. 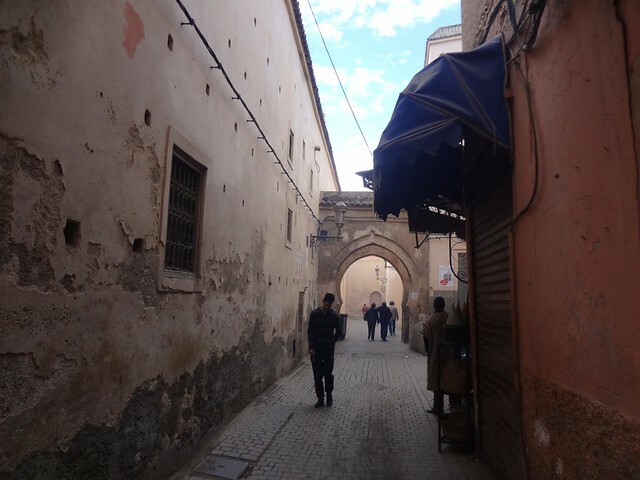 The medina, which is the old district of Marrakech, is home to fascinating souks where you can buy all manner of goods. The stalls that line the narrow alleys are excellent for photographers, because there are colourful and amazing goods piled high that make interesting subjects, while the vendors themselves can sometimes be persuaded to appear in your pictures. For colourful displays, head to the ceramics area, where painted pots abound, or to the carpet and textile souks, where the vibrant fabrics can really add something special to your photos. The winding alleys, narrow archways and traditional buildings in the medina also lend themselves well to photography, regardless of whether you’re in one of the souks or not. The Koutoubia Mosque and its towering minaret is one of the city’s most distinctive landmarks. 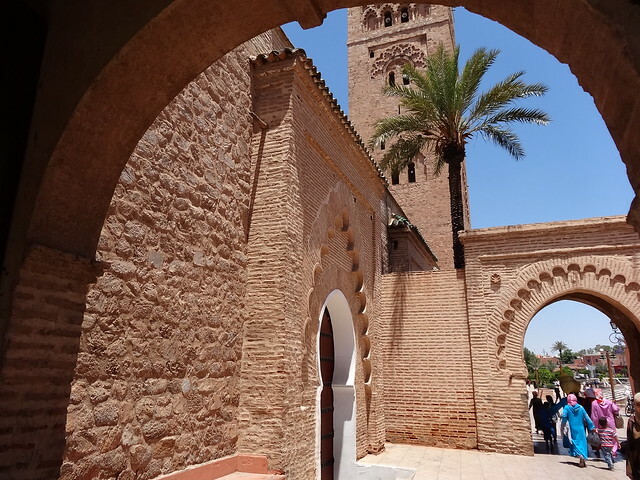 It’s also the largest mosque in Marrakech and, as it’s still an active place of worship, non-Muslims may not enter. However, you’ll have more than enough to keep you busy with your camera outside. This is a wonderful spot for photography if you love architecture, with the traditional Almohad style of the minaret making it particularly spectacular – think curved, ornamental windows, ornate arches and stunning ceramic detailing on the outside of the tower. Another reason why the Koutoubia Mosque is such a great place to grab some photos is that it’s surrounded by beautiful gardens, so there are many potential shots just waiting to be captured. Moving away now from Marrakech’s old district to the newer area known as Gueliz, I’m going to suggest paying a visit to the stunning Majorelle Gardens. This oasis of peace and calm was created by artist Jacques Majorelle and features beautiful local plants, tranquil pools and fountains, winding paths and architectural features that have taken cues from Moorish and Art Deco designs. One of the most striking things here, though, is the artist’s use of a vibrant blue throughout the gardens, with this shade noticeable in everything from tiles to plant pots. There are some wonderful features here that lend themselves perfectly to photography.